It may be time to flush the sediment from your storage type water heater. Sediment is sand, grit or mineral deposits that exist within your water system. Over time, your water heater can accumulate this sediment, reducing the amount of water it can hold. It also reduces the efficiency of the unit, and can create a variety of noises. Whether your water heater is gas or electric, turn off the system before working on it. For a gas heater, set the gas valve to pilot to prevent the burners from coming on. For an electric, turn off the circuit breakers. Connect a garden hose to the drain valve located at the bottom of the tank. Drain the water into a safe location, as the water can be scalding hot. Close the shut off valve to the cold inlet. Open up the pressure relief valve located at the top of the tank. 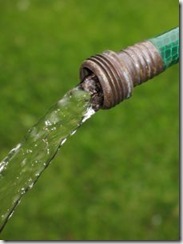 Open the drain valve and allow the water to flow out through the garden hose. If the sediment clogs the drain valve, you may need to break up the hardened chunks. A long screw driver should do the trick. When the water supply from the hose runs clear, you are finished. While this process is fairly straight forward, it can be messy. Your experienced plumber can take over the job for you, giving you the freedom to do other things.